We continue the journey to discover the Roman names, with the vast repertoire of stories, myths, anecdotes and secrets that rest in those names. Much history of the city is also contained in the names of many churches. Piazza della Pace (a few steps from Piazza Navona), for example, is a small square, almost hidden, which owes its name to an important moment in the history of Italy. Around 1480, here was a church dedicated to St. Andrew, which had outside an image of Maria. During an evening outdoors, finished in brawl, a stone struck the face of Mary that began to bleed. Pope Sixtus IV went in procession to the place of wonder and interpreted it as a warning against wars that rend Italy after the Pazzi conspiracy in Florence. The pope wanted in the place was built a temple dedicated to Madonna della Pace, like a votic to invoke Mary to avoid another tear in the peninsula. 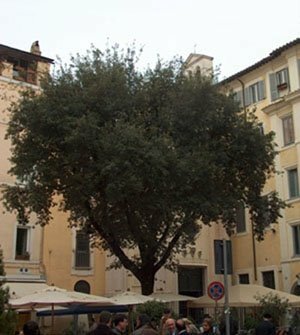 Another curious case is about Piazza della Quercia (behind Piazza Farnese), the origin of whose name is still doubtful. The most credited is that which tells of a church, entrusted in 1532 to the powerful corporation of butchers Romans. As it is tradition, workers belonging to the same category were for the most part from the same locality, in this case, from Viterbo and its countryside. 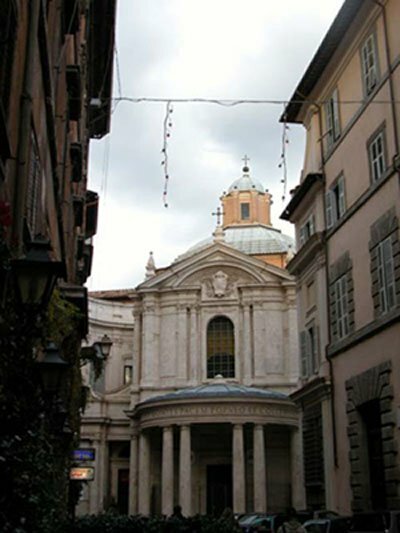 The church, which was originally dedicated to San Nicolò di Capodiferro, became Santa Maria della Quercia also to honor the Virgin in Rome in the omonyme venerated shrine of Viterbo, where is holded the miraculous image painted on a fragment of tile, found near a oak.